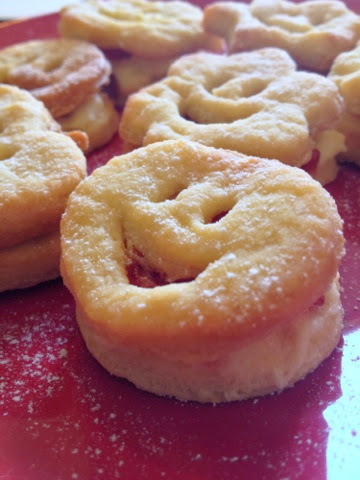 This weeks baking boredom buster is the accomplishment of making a jammy dodger or in my case a jammy smile. I am mastering my skills I hope to make a Victoria sponge cake one day whilst this is not hard in some peoples eyes, I am rather late to the baking and cooking bandwagon, but as they say you are never to old to learn new skills. Tea spoons of strawberry or raspberry jam or infact any jam for the number of biscuits that you bake. Either line 2 large baking trays with greaseproof paper or my personal favourite use Lakeland Cake release on the baking tray. 2. beat together the butter and sugar. Add the flour and milk, and bring together until it make one big ball. Sprinkle your rolling pin and work surface with a little flour and roll until the dough is around the thickness of a one pound coin.
. Leave on the trays to cool, then transfer to a cooling rack. 6. Now you can just leave it at jam in the middle but you don't want to do that do you ?! 100g butter, 200g icing sug, up to 1tbsp milk 1tsp vanilla. Beat butter, beat in icing sugar & vanilla, add milk til fluffy. You feel sad that happy little smiley is going to it's dome don't you? Very nice! And a Victoria Sponge is really not difficult...give it a go! They are super easy to make . Oh wow! These look fantastic. Definitely better than 'shop bought'. Going to have to give these a go. Thank you. Clever you - these biscuits look fab! Will definitely have to give these a go - yummy! We have these cutters, my children love using them! They are so cute and look delicious! Good luck with the Victoria Sponge! Love! I have to have these cutters. Could fill them with chocolate too. Your cutters are fantastic! I am going to have a look at Lakeland and see if they still do them. 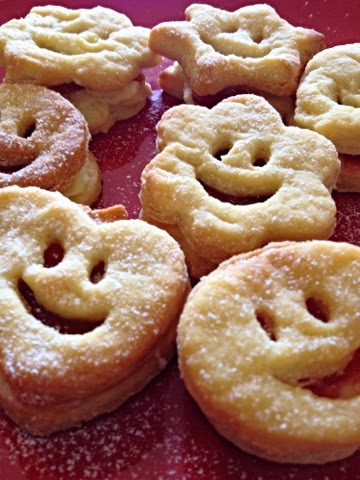 I love the idea of a smiley biscuit and home-made too! What lovely looking biscuits, and it's great that they're home-made. I'm going to get myself to Lakeland to look out for those cutters. These are so cute I love the smiley faces and stars. Please bake me some and send it to me! They look gorgeous! I'm thinking of having a go at these but with nutella in the middle for a change! Haha these are brilliant! 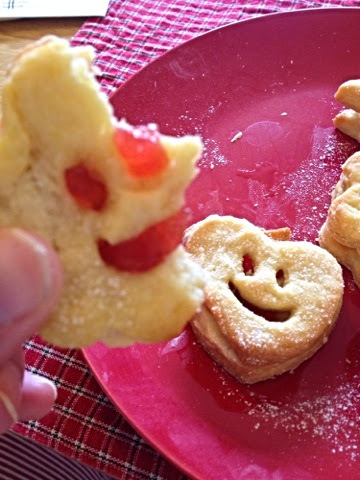 I've never thought of recreating biscuits like this, good work! I've been looking for a jammy biscuit recipe. How Does A Parenting Blog Progress ? Sherlock Holmes Museum : The Game Is Afoot. Simplicity Is the Greatest Adventure.